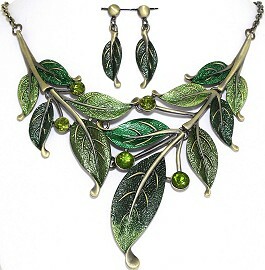 Antique-style Leaf necklace and earrings set. Bronze and green leaves. Antique-style Leaf Necklace and Earrings set in antique gold tones. 20″ adjustable chain. Leaves are metallic bronze and green in color. The set comes boxed.